THE Government has repossessed a hammer mill from persons with disabilities in Kabwe after they failed to utilise it for the intended purpose. The hammer mill was donated in 2013 with the aim of assisting the disabled in income generating activities. However, the machine has not been used and it is currently in an insecure place leaving the Government with no option but to withdraw it. Kabwe District Commissioner Patrick Chishala said when he made an impromptu visit to the site where the hammer mill that he was disappointed with the situation. “I am disappointed that you people have failed to utilise this hammer mill and it’s not even secure here, I am withdrawing it with immediate effect. You will have to submit strong reasons why Government should not give it to other groups that need support’, Mr Chishala said. He warned that all other groups who received equipment through the Government empowerment programmes would be visited to establish if the machines were being used to improve their welfare. Mr Chishala wondered why the group did not get back to his office to engage him on the challenges they were facing to ensure that the hammer mill was utilised to their benefit. 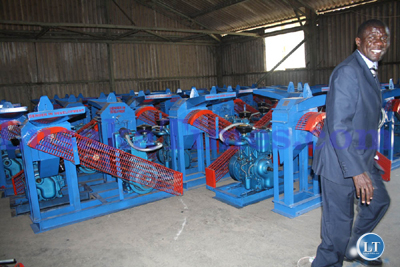 “During the hand over at my office you people assured me that the equipment was going to be operational in Kasavasa. “However, I later came to learn that the hammer mill was in Highridge and I began to worry and suddenly I learnt that it is in Lukanga where we have found it,” he said. He was not happy that people did not care that the Government resources were going to waste when there are people out there needing such empowerment. Meanwhile Kabwe Disability Business solution chairperson Godfrey Mulenga charged that they were duped by some organisation that promised them land at the time of hand over of the machine in 2013. Mr Mulenga said the withdrawal of the land earmarked for the hammer mill in Kang’omba frustrated the whole plan leading to the current situation. “There was an organisation that was dealing in disability issues, so they assured us of land in Kang’omba but there was a controversy over that piece of land in the whole of 2013. Whoever donated the Hammermill is the fool. How do u expect a person on a wheel-chair or crutches to lift a bag of Maize to load into the mill? Stack the bags of Mealie-meal into a pile, load them onto a truck? Mxxm!!! Maloza. i don’t expect such an answer from anyone. The recipients could have hired people to help them load into the hammer mill. Its obvious that they did not want it.